26 July 2008. We went to Exotic Reserve Peyrieras. This is a private park. In this reserve they have captive animals that exist throughout Madagascar. Chameleons, geckos, insects, frogs. And tenrecs. Tenrec you say? Most of you probably have never heard of tenrecs (tenreks in Dutch). 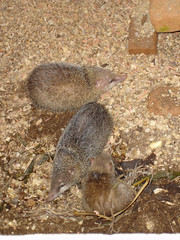 Tenrecs come in quite some variety. They look quite similar to hedgehogs (egels) and shrews (spitsmuizen). 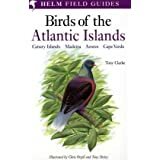 In the past they were classified in the group of insectivores, together with hedgehogs, shrews and moles (mollen). And for the Dutch: yeah, shrews (spitsmuizen) are insectivores, not rodents (knaagdieren), since they are not mice and totally not related to them. Since there were no hedgehogs, shrews and the likings on Madagascar - very limited number of mammal families do exist there, evolution did its trick. Convergent evolution made the tenrecs find the niches left untouched by the absense of shrews and hedgehogs. Tenrecs now look like shrews, hedgehogs (with spines!) and even otters. So, tenrecs are not insectivores. What are they? Still weird creatures. 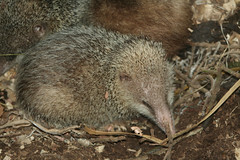 Recent genetic research has shown that tenrecs must be put in a new clade or superorder Afrotheria. The Afrotheria is a bizar group of animals. Apparently with no relation at all. What's in there? Tenrecs of course. The better known are the elephants and sea cows or manatees. 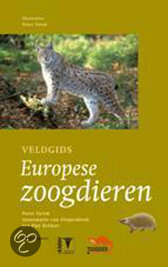 Furthermore hyraxes (klipdassen), the closest living relatives to elephants. They have the size of and look a bit like an Alpine marmot. Let's also not forget the weird aardvark (aardvarken). If you look at my photos in Biological Classification menu, you can see the close relations between elephants, hyraxes and tenrecs.